There is a major notion among many that it is only the elite sector of the society who can create trusts. However, that is not true! A trust can be created by not just the high –networth individuals but even by ordinary men and women. The provisions of the Indian Trust Act, 1882 (referred to as “The Act” in this article) governs only private trusts. Public Trusts are usually governed by state-specific legislation. Eg: The Maharashtra Public Trust Act, 1950.The Indian Trust Act extends to the whole of India except the state of Jammu and Kashmir and Andaman and Nicobar Islands. Further, this act is not applicable to the Waqf, religious or charitable endowments and to a few others. What are the objectives of a trust in general? Who can create a Trust? Which are the types of trusts that can be created? What are the registration mandates for a Private Trust? 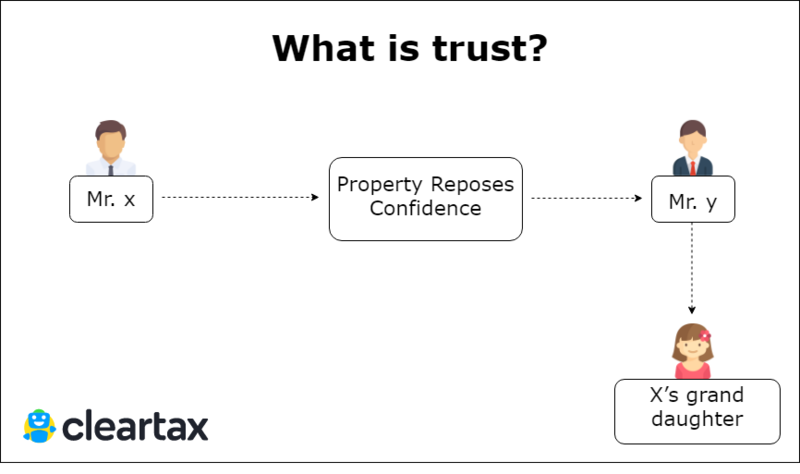 How does taxation of Private Trusts happen? Mr X wants to pass his bungalow (property) to Mr Y for the benefit of his minor granddaughter. Mr X passes his property to Y, because he reposes(has) confidence on Y. This is nothing but the essence of a trust. In simple words, a trust is nothing but transfer of property by the owner (Mr X) to another person on whom the owner has confidence (Mr Y) for the benefit of a third person (Granddaughter of X). Property doesn’t just mean real estate. It could be cash, shares or any other valuable asset. Further, the instrument by which this entire trust is declared/created is called “the instrument of trust” or the “trust deed”. Author/Settlor/Trustor/Donor (Mr X): The person who wants to transfer his property and reposes confidence on another for the creation of the trust. Beneficiary (Mr X’s granddaughter): The person who will benefit from the trust in the near future. The main objective is that the trust should be created for a lawful purpose. For example, if Mr X had stolen money from a bank and given it to Mr Y with the intention of giving the money to poor children then, in this case the trust itself is void as the very main purpose* is unlawful. *So how do we actually understand as to whether the purpose is lawful or unlawful? The answer to it lies in Section 4 of the Act. If a trust is to be created by on or behalf of a minor, then the permission of a Principal Civil Court of original jurisdiction is required. Further, it also depends on the law in force that is prevailing at that particular point of time and the extent to which the author of the trust may intend to dispose of his property. 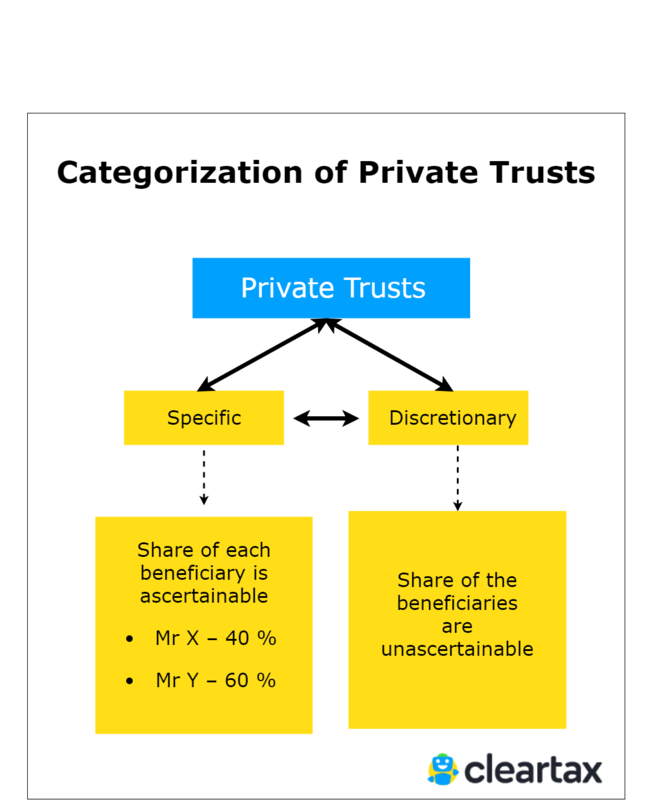 Private Trusts: A private trust is for a closed group. In other words, the beneficiaries can be identified. Eg: A trust created for the relatives and friends of the author. Public Trusts: A public trust is created for a large group ie. the public in large. Eg: Non-Profit NGO’s Charitable Institutions for the general public. Immovable property: A private trust must be created by a non-testamentary instrument in writing. Further, the non-testamentary instrument needs to be signed by the author of the trust or the trustee and has to be registered. However, if the non-testamentary instrument is created by a will, registration is not necessary. Movable property: A trust in relation to movable property can be declared as in the case of immovable property or by transferring the ownership of the property to the trustee. Hence, registration is not mandatory. 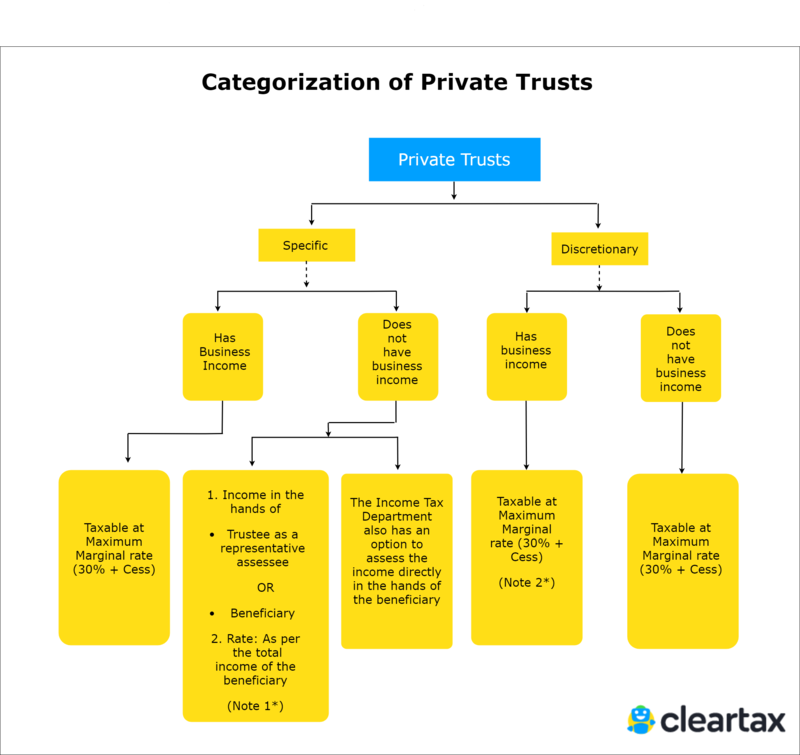 From the purpose of income tax, private trusts can be categorized into two types.